The 2017/2018 season came to a screaming halt in the National Football Conference Championship game against the Eagles. It was both devastating and shocking to see a season with so much excitement, end on an incredibly negative note. It left many questions heading into the offseason and none bigger than who will be the offensive coordinator of the Minnesota Vikings. The Vikings have been in full search mode for a new offensive coordinator after Pat Shurmur accepted a well deserved head coaching job with the New York Football Giants. He fixed many issues from the previous offseason that I recall asking myself a year ago today that I thought would keep this team from being the success story. I am left with those same questions today. What will the offense look like? Who will be the quarterback to get outside playmakers the ball? What will the running back position look like? Will the offense be predictable like previous years? After having the first Sunday without football, and four weeks after the season ended, some of those questions have been answered. "The Vikings have to wait ten days until the season ends to interview John DeFillipo and it is apparent that they are willing to wait." All signs pointed to the Vikings having interest in DeFilippo. Executives of the Vikings flew out to Philadelphia for an interview as soon as they were able. They allowed DeFilippo to enjoy a massive parade on Thursday celebrating their World Championship. That night the Minnesota Vikings offensive coordinator position was officially filled. 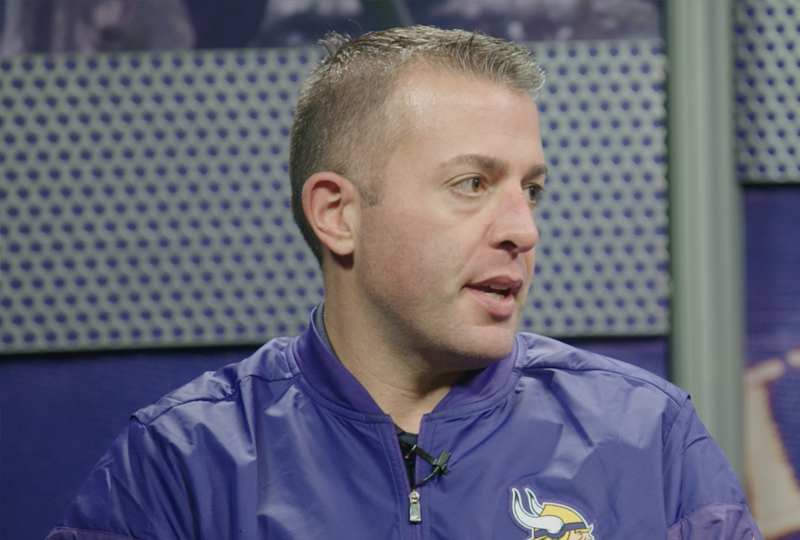 John DeFilippo is young and ambitious. He climbed the ladder incredibly quickly and caught the attention of NFL executives at the age of 29. How did he do this at such a young age? Let's take a look at his beginnings. The now 40 year old was once a promising starting quarterback at James Madison University. It came to an end in a quick fashion after a devastating hit that broke his ribs and resulted in a collapsed lung. Rather than enjoying his last semester of college, he decided to accept his first coaching job as a quarterback coach at Fordham University. DeFilippo formed a connection with the then head football coach, Dave Clawson, during a football camp at Vanderbilt University where his father was the athletic director. The plan was to allow DeFilippo a minimal role to learn under Clawson. This came to be a short term thought because Clawson could see the ambition of his pupil. After just one season at Fordham, DeFilippo went to Notre Dame as a graduate assistant. Clawson once was once quoted saying, "If you get DeFilippo, you are getting a future star." DeFilippo still had his doubts. He spent the next half of a decade climbing the ladder before eventually landing a gig as the quarterbacks coach of the Oakland Raiders from 2012-2015. His track record developing quarterbacks in the NFL is eye opening. He helped develop Derek Carr and did so with much success. Carr led all rookies in almost every statistical category and set multiple rookie records. The Cleveland Brown's took notice and hired DeFilippo as their offensive coordinator. His first big time shot at the professional level. In the 2016 season, Josh McCown finished with a 93.3 QBR (Quarterback Rating), the fifth best in franchise history. Gary Barnidge emerged as a threat in the passing game, setting career high's in receptions, (79 - third among NFL tight ends) receiving yards, (1,043 - fourth among NFL tight ends) and receiving touchdowns, (9 - fourth among NFL tight ends). Before 2015, Barnidge recorded only 44 catches for 603 yards and three touchdowns in 91 career games. In 2016, DeFillipo was hired as the quarterback coach of the Philadelphia Eagles. Carson Wentz was an MVP candidate before tearing his ACL. It was devastating to the team. Nick Foles stepped in and in two outings against Oakland and Dallas was average at best. In those games Foles had a QBR of 59.4 and 9.3. He left many, including myself, believing that the Eagles were not a true one seed heading into the playoffs. This as we know now turned out to be far from the case. DeFilippo had his quarterback composed and prepared. This is Nick Foles that we are talking about. It still leaves me in shock. The DeFilippo hire by the Minnesota Vikings has signs of being one of the best since Mike Zimmer. In a team that has been arguably quarterback deprived in multiple seasons this last decade; this hire could pay dividends. The team will do so under great management and leadership. If you are still in doubt, just watch his weekly 10 minute podcast on YouTube throughout last season with the Eagles. I have no problem saying that he is a football genius. After you listen to his podcasts, I know that your opinion will be the same. This is a great hire fellow Vikings fans.